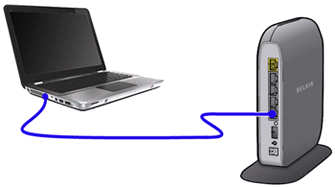 Checking or verifying the wireless settings on a Belkin router is important when connecting wireless devices to your wireless network. This is recommended if you are unsure of your router's wireless settings. Before you proceed, make sure the router is ON and is connected to your computer through your router's Ethernet port. NOTE: The images and steps may vary depending on the Belkin router's model and version number. In the examples shown below, the Belkin F7D4301 is used. Launch a web browser, enter the router's IP Address in the Address bar and press [ENTER]. The default IP Address of Belkin routers is 192.168.2.1. If it doesn't work, check your router's IP Address. For instructions, click here. Once prompted, enter your router's Administrator Password then click Submit. If you have not set a custom password for your router, just leave the field blank and click Submit. On the left navigation panel, click Channel and SSID. Look for the SSID and take note of it. This is the name of your wireless network. If you decide to make changes on your network's SSID, make sure to click Apply Changes to save the new network name. 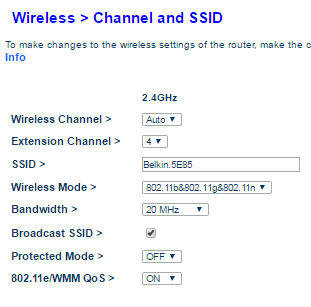 The Broadcast SSID should be checked in order for wireless devices to detect the wireless network of your Belkin router. 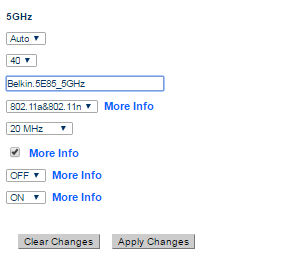 Similarly, for dual-band routers, the 5GHz band's SSID is also your network's name. Click Security on the left navigation pane. Look for the Pre-shared Key (PSK) and take note of it. This will be your password to connect wireless devices and computers to your network. You may also need to take note of your Security Mode. NOTE: Ticking the Obscure PSK option will hide your Key's characters. If you want to view it, simply uncheck the box. IMPORTANT: The wireless settings of your router are case-sensitive. Make sure that you write them down correctly.